This family home was designed with easy-to-see streamlined storage so it’s a snap to find figure skates, lacrosse sticks, and snow boots. And the storage is even easier to use, meaning kids will actually put things where they belong. Thoughtful touches abound. The office is stocked with supplies, making last-minute runs to the store a thing of the past. The laundry room windows, counter, and flatscreen TV make sorting, pressing, and folding clothes a pleasure—or close to it. 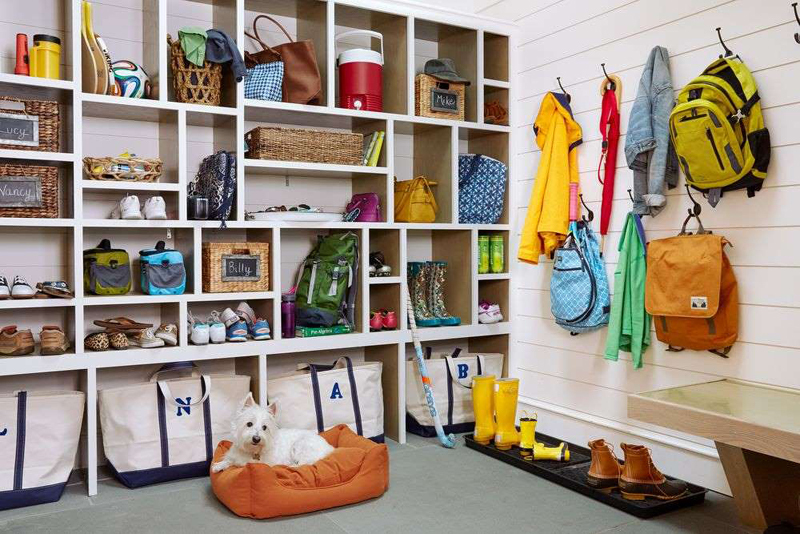 And the mudroom corrals backpacks, coats, and even the dog’s bed in a central spot, blocking the mess from migrating into the rest of the house. A U-shape desk anchors the study area and is built with base cabinets and butcher-block counters. Upper cabinets hide crafts and office supplies, with cubbies underneath for bulk paper and envelopes. To decorate the space, an easy window swag created with twine and clothespins showcases kids’ artwork. Each workstation features enough desk space to fit a laptop and an open notebook at the same time. This area includes a corkboard to display artwork and invitations. 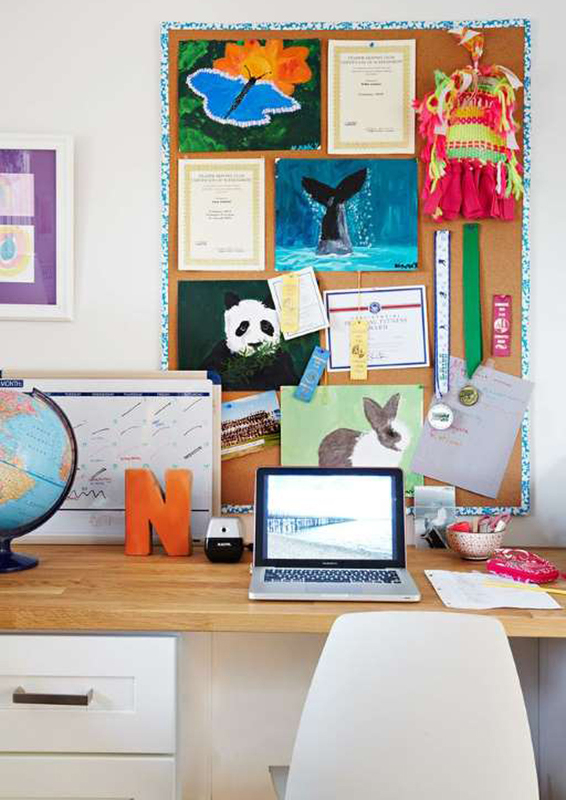 Each child has a dedicated workstation with her own chair, desktop, and drawer for papers and projects. Shared supplies such as paper, binder clips, and staplers are stashed in a bank of wall cabinets. A stacked washer and dryer, tall shelves, and hanging rods make full use of one laundry room wall. Towels are stored in this space to cut down on the girls reaching for a fresh towel after each shower. Looking for more room to work? 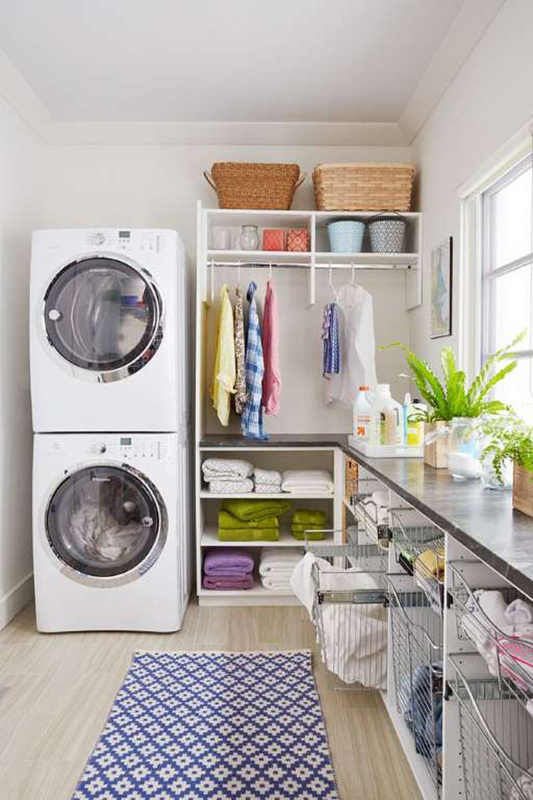 A long stretch of countertop in the laundry room helps keep the mess of laundry day contained. Windows welcome plenty of natural light into the laundry room. The bins are great for sorting laundry, with dirty laundry in large bins on the bottom and clean and folded laundry in the upper bins. All slide out like drawers for easy access. 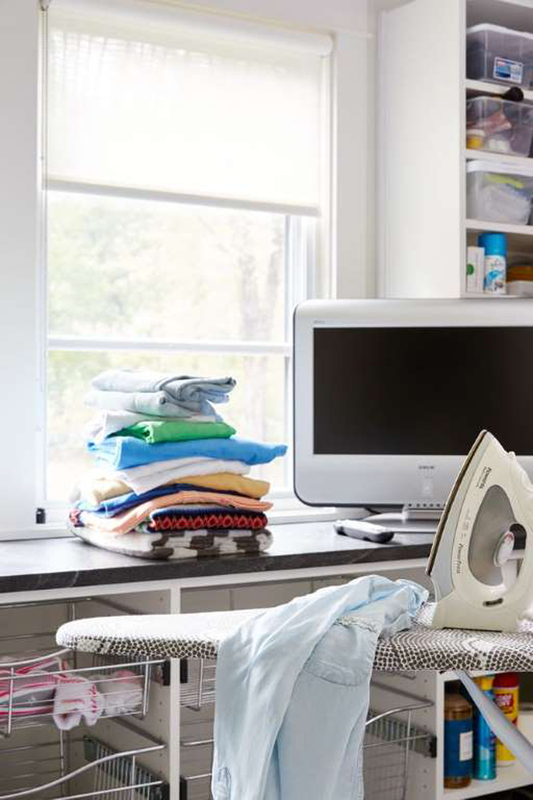 This laundry room setup is great for catching up on your favorite shows while doing your weekly ironing. 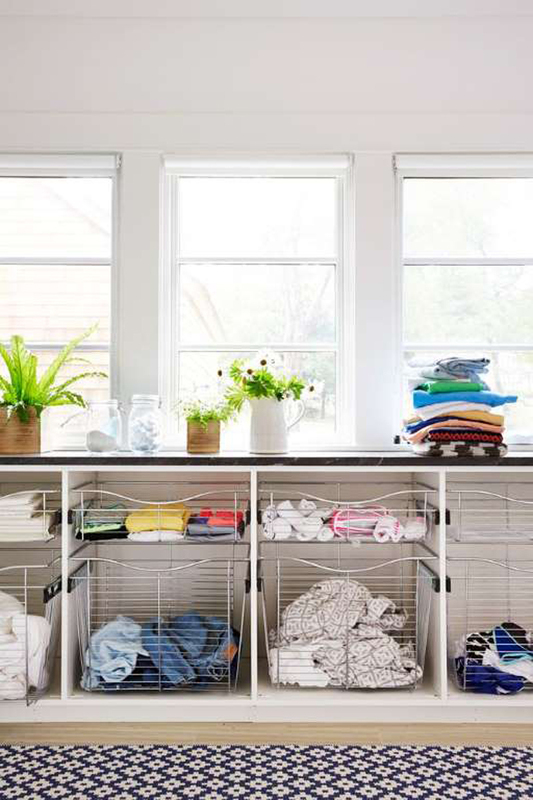 An ironing board stays tucked away in the laundry room cabinetry until needed. 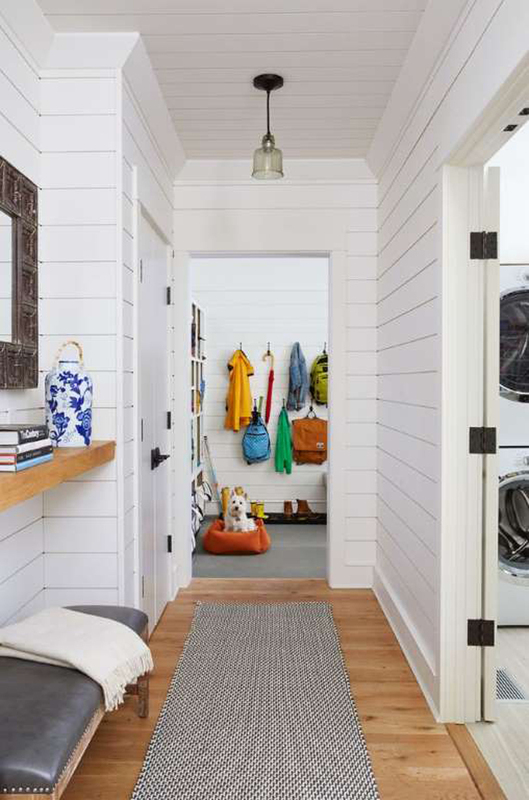 A short hallway leads from the laundry to the mudroom. Even this small space is stocked with storage. Two closets stash off-season clothing (swim gear or winter coats and boots) behind closed doors. 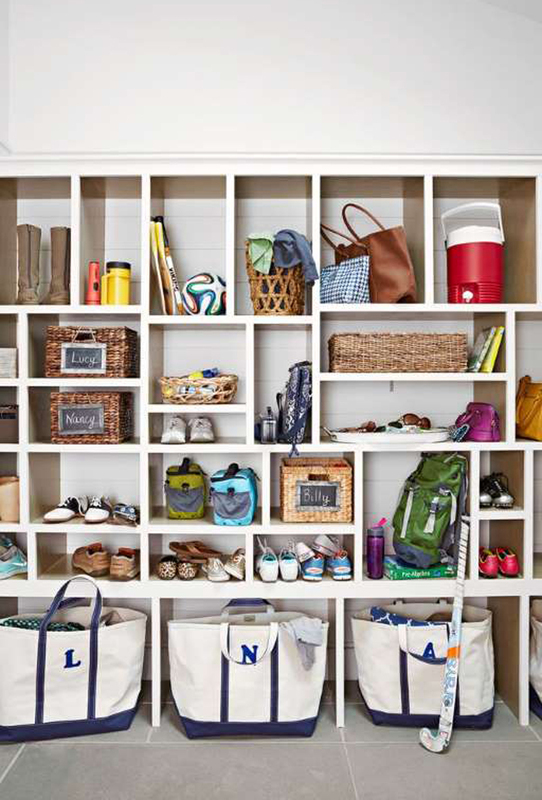 In the hardworking mudroom, two rows of double hooks line one wall, catching backpacks, umbrellas, and jackets as the kids come inside. There’s also a bench for putting on or taking off shoes, a tray for wet or muddy boots, and a plush dog bed. To ensure a wall of open shelves will hold all of the family's gear, they measured large items and sized cubbies to fit. Each daughter has a monogrammed tote on the floor for supplies so all three can grab and go each morning. Easy-to-lose small items—gloves, hats, and dog toys—are piled in baskets stationed in some of the cubbies. 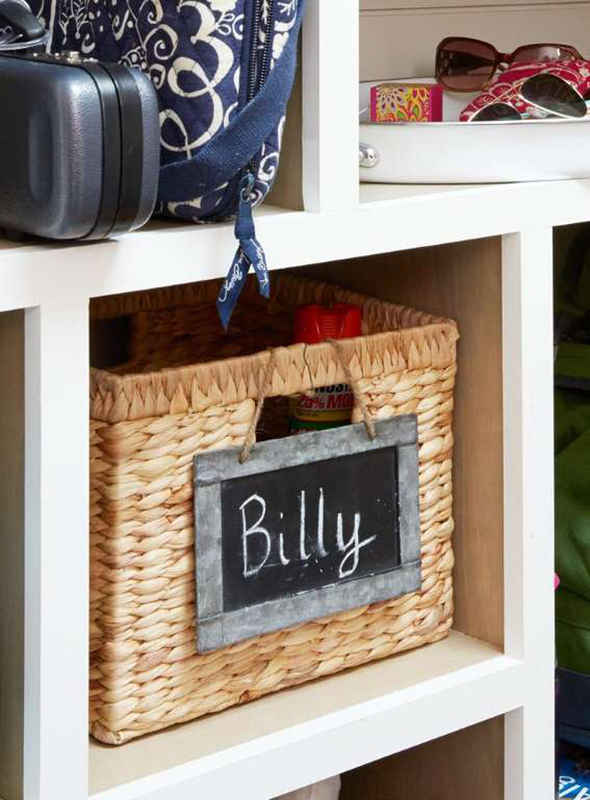 The matching baskets feature chalkboard storage labels for a whimsical look. Bonus—they can be changed later if needed.